I bought this dress a few years ago at a thrift store. I was attracted to the print, but the dress itself was almost down to my ankles. Luckily it was nothing a sewing machine and a pair of scissors couldn't fix. It's one of my favorite dresses. It fits really well and if you've ever thrifted you know that it's hard finding vintage that fits. It's either too big, too tall, or too tiny. It's hard to find a balance, but this dress? It's a gem. Last night, I went and saw Against Me! & the Sidekicks. It was wonderful, loud, and incredibly fun. The Sidekicks are one of my favorite bands and so, I was thrilled that they played my favorite song. They also killed it live. Seriously. It was perfect. It was also my first time see Laura Jane Grace in all her womanly glory (she's trans gender). So it was an entirely lovely experience. It was also my first time seeing her since '07! Dang. 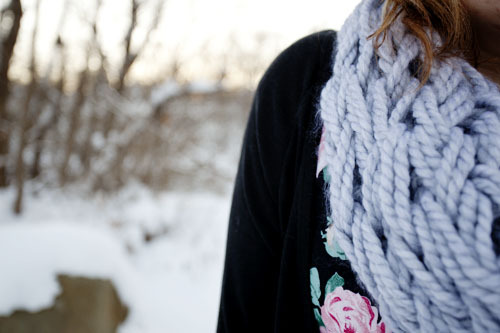 This scarf was from a Christmas City Swap that I joined over on Be Up & Doing. More on that later because I'm about to get some breakfast, but I love it!